After three weeks of traveling around the Balkan countries by bus, I’m now making the transition to sailboat. For the next two weeks, I’ll be sailing down the Dalmatian Coast in Croatia, from Split to Dubrovnik. I’m skippering a 47-foot monohull with 4 cabins and 4 heads (i.e., 4 bedrooms and 4 bathrooms). This transition gives me the perfect opportunity to talk a bit about the pros and cons of bus travel, and to offer some tips. I have done a lot of travel by bus, mostly in South America and Europe. While I don’t proclaim to be an expert, I do have a LOT of experience to draw from. At some point in the near future, when I have good WIFI and time on my hands, I’m going to create a “Travel Tips” section of my website - that’s where a lot of the information below will reside. For now, though, it’s just part of my journal. As you can probably guess, these days, a sailboat is my preferred vehicle for getting from Point A to Point B. But, if I have to travel over land in a foreign country, going by bus is a pretty good alternative in my opinion. 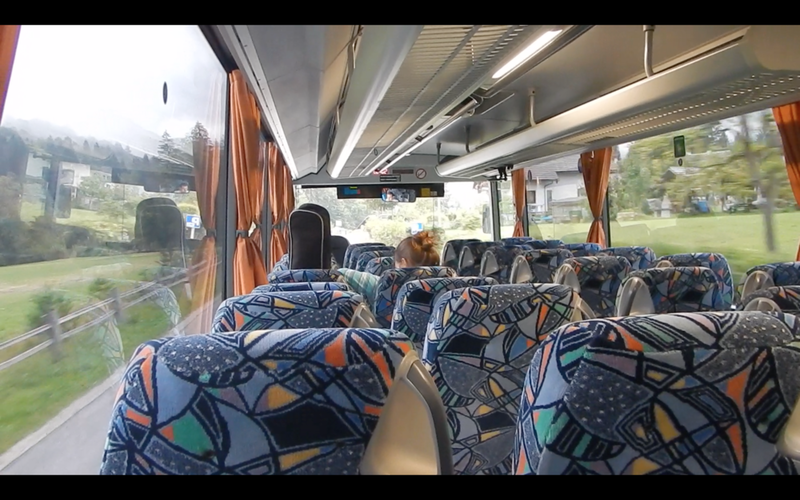 The biggest advantage of bus travel is the cost: it is CHEAP! 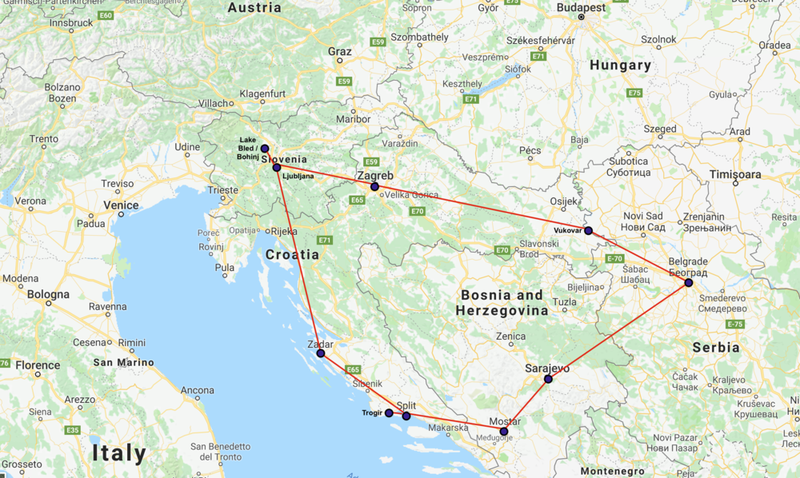 At some point I’ll add up the cost-per-mile of my Balkan country tour and publish it. The minimal cost will astound you. Cost aside, I’m sure you probably think that buses are slow, crowded, and uncomfortable, right? Well, sure, they can be. But some of these issues can be avoided or minimized, and some can be turned into a positive. Let me explain. One reason buses are slow is they stop frequently. But look at the bright side — this means your routing can be VERY flexible! You can go from almost anywhere to, well, almost anywhere else! Side note: Some hotels turn off the power to plugs if you don’t leave the room keycard in the slot by the door. So, while you’re at dinner (with the keycard) your electronics aren’t charging. Solution: Ask for a second keycard! CROWDED. Sometimes buses are crowded. But I try to avoid this by doing a lot of travel in the off-season or edge of the season. Definitely don’t travel at peak. If buses are crowded with locals, use the situation as an opportunity to observe daily life. Who are these people? Where are they going? What are their lives like? If they are tourists, maybe you can strike up a conversation about travel tips, funny stories, hot spots, etc. UNCOMFORTABLE (PART 1). This is often due to user error. You know it’s going to be a bit uncomfortable, no matter what, so plan accordingly. Dress comfortably. Just because the bus says “Air-Conditioning” doesn’t guarantee it will be working. Wear loose-fitting clothing; dress in layers. Use the bathroom before you depart! Like everything else, just because there is a toilet on board (maybe), you can’t assume it works. I was on a bus where the toilet was out of order, and it was a 5 hour bus ride! Now, on long hauls, the bus will usually stop for 10-20 minutes at a truck stop or restaurant, so people can use the toilet, get some food, smoke a cigarette, etc. BUT, be careful about the definition of long haul. I was recently on a trip from Belgrade to Sarajevo. We left at 4:00pm, and had a toilet break at 5:30pm. Then, we drove straight through until 11:00pm without a break! There was a toilet on board but it didn’t appear to be working… at least no one used it. Bring a few snacks to nibble on, too, especially if it’s a long haul. Again, there is no guarantee if, when, or where they are going to stop - or what’s offered at the stop. I always bring a bottle of water with me, despite the aforementioned toilet challenges. I usually bring some kind of cheap ham and cheese sandwich. My latest trick is to bring nuts (I like cashews and almonds). The nuts are healthy, and packed with calories and protein to keep my energy level high. So stay hydrated, eat something, and just be careful about the toilet use. UNCOMFORTABLE, PART 2. Certainly, in some cases, the discomfort is not your fault. There may be some inherent “equipment issue” that makes the bus uncomfortable. Specifically, seating. So let’s talk about seating. Usually the ticket comes with a seat assignment printed on the ticket. But in my experience, most people ignore this assignment. Get on board and grab a seat you like, whether it’s an aisle or a window, at the front or at the back. Then check all aspects of your seat. Is it stable? Once I was on a bus and my seat was because one side of the brackets had come unbolted. Does your self belt work? It may not. Better to have and not need, than need and not have. Other things to check (but probably bus-wide issues) include: Does your air-conditioning vent work? Do the plug, USB port, headphone jack, overhead light, etc. work? Now, there are some strategic decisions you can make while choosing your seat. Check your route - which side of the bus will offer the best view? Which side will be in the sun vs. the shade? Trust me, suns sounds good for about the first 30 minutes, then it’s annoying. If you are on the sunny side, make sure the curtain works. (Again, recently I sat in a seat where the curtain was missing a few rings, so it continually draped down into my face. ) If you plan on taking pictures or watching the scenery, choose a window seat that has a full window view, not next to a support pillar. Which side of the bus was your luggage stored on? (If I don’t care about the view or sun, I usually try to site on the side where my luggage was stored: that way I can keep an eye on whether someone takes it out.) More often than not, luggage goes in on the right hand side of the the bus (the curb side). Thus, everything else equal, I like to sit on the right hand side of the bus, so that I can watch people take luggage out of that compartment. If nothing else, sitting on the right (in drive-on-the-right countries) enables you to keep a close eye on street signs that indicate distances to towns, street names, etc. This will help you figure out where the heck you are. In general, I find that most people prefer to sit forward. So, for me, I like to sit toward the back of the bus. I like my space, and I can keep an eye on things since the bulk of the bus and passengers are forward of me. In addition, I feel safer the back in the event of a head-on collision. So yes, buses can be slow, crowded, and uncomfortable. But you can minimize some of these unpleasantries and, if nothing else, you can stay positive and look on the bright side. Let’s talk a bit more about preparatory and precautionary steps, in advance of your bus trip. SAFETY. We all read about (and want to avoid) crazy bus crashes in foreign countries. Unlike an airline, there is no safety briefing on a bus, so I usually do my own. I mentioned the seat belt. I make sure I have one, though admittedly I usually only wear it on curvy mountain roads, rainy weather, and overnight trips. Or if the driver is just driving erratically or aggressively. I also look for the emergency window breaker, fire extinguisher, and exit door / window. If these aren’t in plain view, I don’t necessarily go out of my way to find them - but I just look around to see what’s in my immediate area for use in case of emergency. Some drivers are very helpful, and will respond if you ask ahead of time about stops along the way (for bathrooms or food) or about your stop in particular. I try to preload my phone or computer with a map of my next destination. I like to book my room ahead of time too, so I’ll usually try to map the route from the bus station to my hotel and save it as a screenshot. Usually. Sometimes I forget to do this, or don’t do it in enough detail, as was the case recently in Sarajevo. And remember, make sure your electronics are charged! THEFT. Your backpack or suitcase, generally speaking, is fine stored below in the luggage compartment. I don’t know if it’s a scam or not, but the driver or assistant will frequently charged you $1-$3 USD equivalent for the storage. Don’t argue. Just pay it. You don’t want to anger the man who is safeguarding your goods. Make sure you confirm your final destination with him, though. That may influence where he puts your bag. While your bag will (probably) be fine down there in the storage compartment, don’t be a complete travel noobie. Take out anything you don’t want to lose and put it in the daypack you carry on board the bus with you. For me this means: passport, wallet (cash/credit cards), any extra cash (I always carry several hundred USD), phone, computer, camera, external hard drive (for backups), and charging cables. After hours, days, and weeks of bus travel in my 25-year history of international travel, I still find bus travel one of the most fun ways to get around…. IF you take the necessary steps of preparation and precaution, if you make some good (lucky) seat choices, and if you have the time to sit back, relax, and enjoy the unique cultural experience. Notice I said “one of the most fun ways.” I’m just about the embark on THE most fun way: sailing! Stay tuned as I sail down the Dalmatian Coast in Croatia! My bus in Slovenia sure had some ‘fun’ decor! And what a scenic ride! This was my route, starting and ending in Split, going in a clockwise direction. I covered 1,920 kilometers (about 1,200 miles) in 3 weeks of bus travel. Total bus fares came to about $250. So averaged about $0.20 per mile.